ServerLIFT announced their trade show exhibition schedule for the spring of 2018. Event attendees can actually experience ServerLIFT assisted lifting devices that remove, transport, position, and install heavy equipment in data centers, at the touch of a button. Trade show visitors come to understand the improved safety and efficiency of server handling when they see our lifts live. You can’t really appreciate how robust and convenient these lifts are until you experience them for yourself. March 26-29 NVIDIA GPU Technology Conference (GTC) in San Jose, California. This premier conference focuses on artificial intelligence (AI) and deep learning. Visitors will learn about university research breakthroughs and the latest from AI startups and major-league enterprises. In addition, it will cover autonomous vehicles, smart cities, and virtual reality. ServerLIFT also recently participated in Data Center World Global 2018 in San Antonio, Texas, a show that featured more than 1,000 exhibitors from data centers, facilities, and IT infrastructure industries. In addition, another 3,500 members of the Association for Computer Operations Management (AFCOM) participated in the event. ServerLIFT attends shows to ensure that their products and solutions always meet the ever-changing needs of IT industry operations. 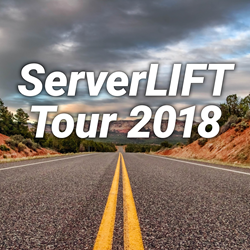 ServerLIFT exhibits at these shows to give IT managers hands-on experience with the lifting equipment for themselves, and to see how these lifts make the removal, transport, positioning, and installation of heavy data center equipment far more convenient and safe. ServerLIFT Corporation manufacturers the world’s only data center lift capable of safely and efficiently transporting, positioning, installing, and removing servers in any data center environment.